Hi Miss B! It’s definitely realistic to believe that you can chase your passion and earn money from it. I’m living proof of that. However, how this works is probably not what most people imagine it to be. Firstly, it’s NOT realistic to think that one can just quit their job, pursue their passion, and earn big bucks right away. Many don’t succeed. Those who do only start seeing real results after a few years. Secondly, it’s not realistic to think that one can earn money from pursuing their passion in a random way, without considering market needs. Thirdly, it’s also not realistic to think that one can generate money from their passion right away with no related experience/skills. Just like you can’t expect to get a job right away when switching to a completely unrelated field, you can’t expect to take off in your passion career by “boldly” pursuing it, without any plan or strategy. The reality is it’s not easy. BUT it’s not impossible. As long as you are ready to put in the hard work, are prepared for the possibility of no returns for the first few years, and are versatile enough to turn challenges into solutions, then I say you have a good chance of success. But how does one create their dream career? I’ve shared a couple of frameworks before — my Mind-Body-Heart-Soul framework and Message-Medium framework — which I recommend you to check out. Today I want to share a different model which I call the PMS framework (nothing to do with what some of you may be thinking by the way!). 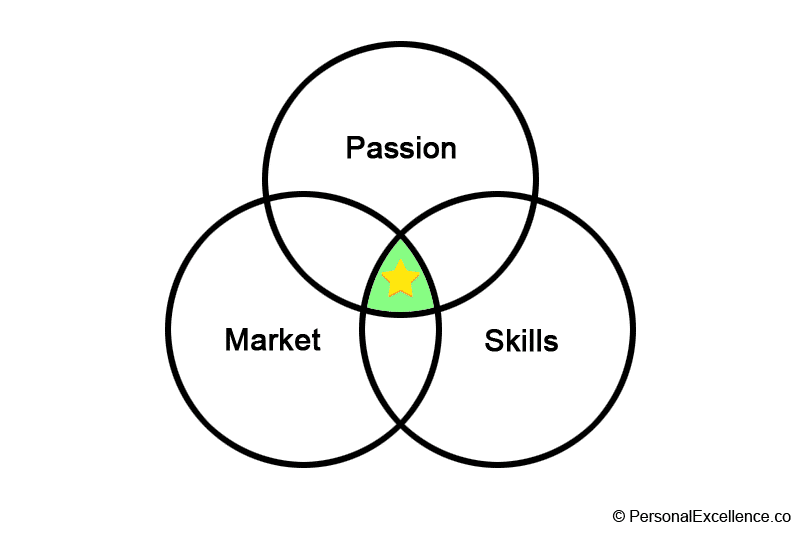 The 3 circles represent the different components of an ideal career. 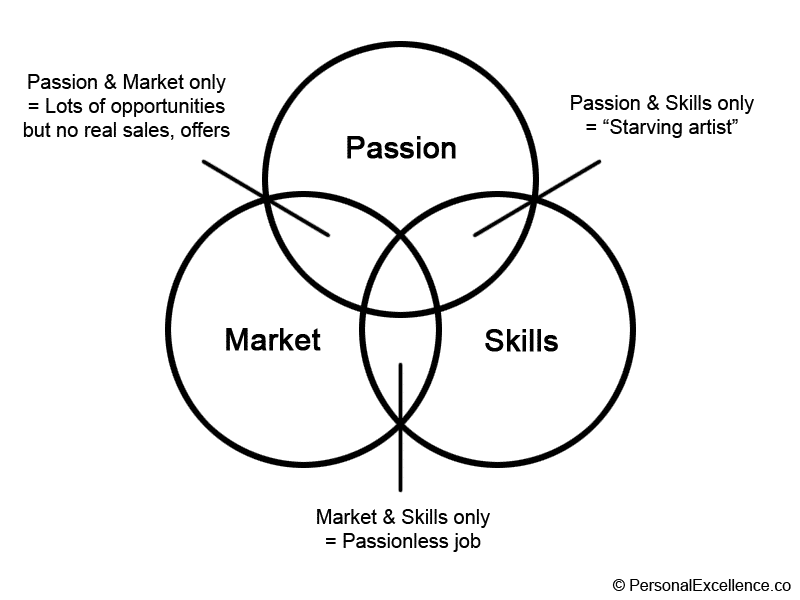 People with Market & Skills, but no Passion. These are people with marketable skills, which gets them a job that pays well. Miss B is in this category. However, without passion for their work, work becomes a dread. Even though someone can theoretically keep working their way up in such a career path, the job will eventually hollow them out. I was once in this category, and I subsequently quit to pursue my real passion to help others grow. 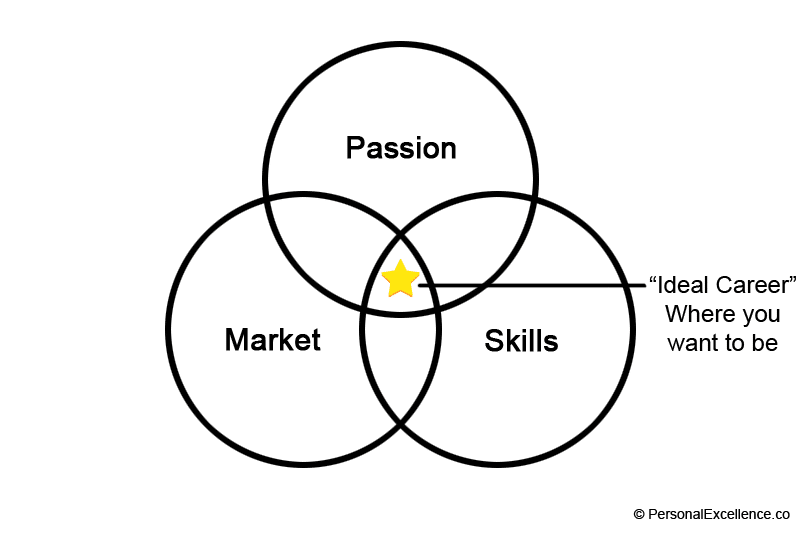 People with Passion & Skills, but no Market. These people have a passion for their work and are very skilled in what they do, but there is little market demand to make a good living. A good analogy is the “starving artist” archetype, where you see talented artists who are not able to make ends meet because there isn’t a big (job) market for their work. Because of that, there is a limit to how much they can earn. 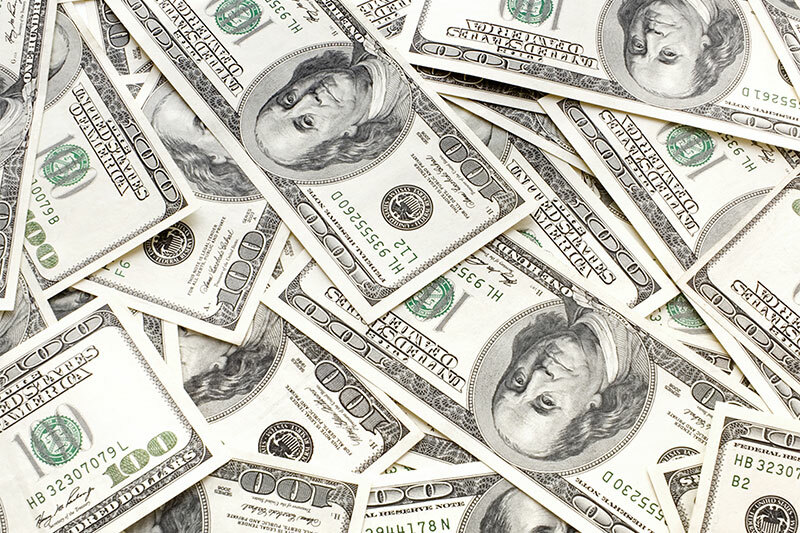 Money is constantly a constraint in their decision making and life. 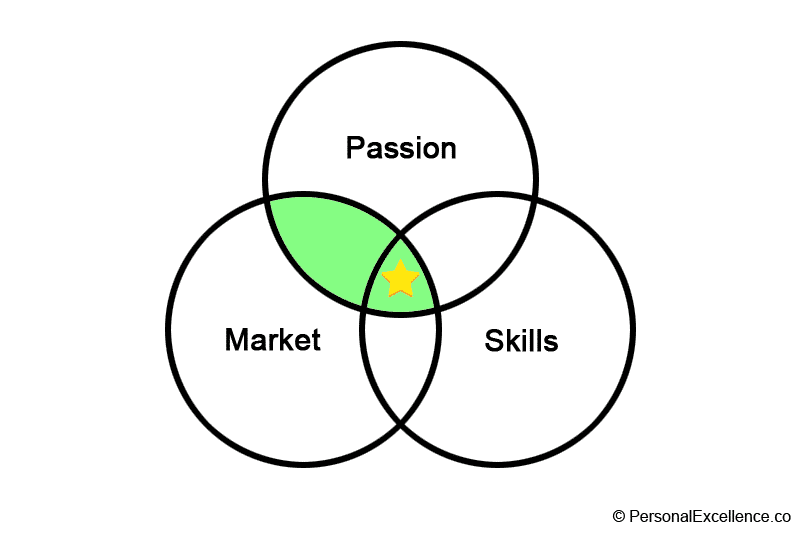 People with Passion & Market, but no Skills. These people are better off than people in the first 2 categories in that they love what they do and they are in an industry with lots of opportunities. However, they don’t have the skills to land these opportunities. Note that by skills, I mean (1) skills relative to other players in the market, meaning you can be skilled but if there are plenty more skilled alternatives than you, the market will favor them, and (2) any skill required to succeed in your passion, such as skills in your craft (e.g. public speaking if you’re a speaker), skills in self-promoting, skills in networking, etc. Without competitive skills, these people struggle to land opportunities, sales, and good job offers. Clearly, all 3 scenarios are not optimal. While some may rationalize that having a job they hate is better than having no job (which is true), in the long run they’ll only be miserable as they get hollowed out from doing something they hate each day. While some may rationalize that they’d rather pursue a passion and earn little money than be in a job they hate with lots of money (which is true for people with no heavy financial needs), in the long run they’ll find themselves restricted in how they live their life and how they can pursue their goals. As for the last scenario, people in this scenario start off happy and excited, but are clueless at what’s about to hit them. An example would be someone who quit their job to start their blog business or to create apps (both of which are supposedly thriving industries now), but they have no idea how competitive the field is and are forced to quit later on when they fail to get any sales, despite months of hard work. 1) Can you spot where you are in this diagram right now? 2) Which is the ideal spot? If you answered that the ideal spot is the intersection between all 3 circles, you’re right! This is a career (1) you’re Passionate about; (2) where there’s a Market demand for it; and (3) which you have the Skills to thrive in. That’s the career you want to be in. So how do you get into this sweet spot? First off, I want to highlight that getting to this spot is a process that can take years, especially if you’re starting from scratch. For example, if you have no idea what your passion is and you’re just entering the workforce, then it’s obviously going to take a while before you get a career with all PMS criteria. That’s because not only do you need time to figure out your passion, but you also need time to build your skills in it later — if it’s different from what you’ve been doing. On the other hand, if you’ve been working for years in various highly skilled jobs, then all things being equal, even if you don’t know your passion right now, you already have some reference on what you may like / don’t like. Hence, you can better pinpoint what you want to do later. Not only that, working for so long would have given you some hard/soft skills that you can use for your passion journey later on vs. starting from scratch. A few months from the point I started to look for my passion/purpose to the point I discovered it. Note that in these few months, I was really DIGGING and SEARCHING to find my passion/purpose as opposed to playing lip service to the idea. Before that, I was actively pursuing different goals and interests throughout my childhood and teens as I detailed here. You can count that as 15 years of “pre-work” before finding my purpose! After discovering my passion/purpose, it took me another 2.5 years to pursue it. This would be December 2008, when I started this blog and my personal development business. Before this, I was working in a corporate job to gain as much experience as possible. The first thing you should understand about the PMS framework is that these 3 circles are like moving parts of a whole — they can be nudged, to some extent, to form your ideal career. For example, if you’re in a job you’re not passionate about, you can always try to find something good about it. If you have a passion that doesn’t have a big market, you can look for ways to adapt your passion to the market. If you have no skills in what you’re pursuing, you can always build them. However, the circle that’s least “nudgeable” is “Passion.” With “Market,” there are practically no limits in who you can reach today, thanks to the internet and globalization. With “Skills,” there’s nothing you can’t learn as long as you are willing to put in the time and effort, since human potential is basically limitless. However, you can’t make yourself love something if you dislike, or even hate it. Hence, “Passion” is actually the most definitive part of our ideal career, and the first thing you should work on uncovering. Even if you turn out to have zero skills in your passion and you have no idea how to pursue it (like me when I discovered my passion), you can, at that point, start taking baby steps to build your ideal career. Without knowing your passion though, you would be building random skills and building yourself up a particular career to earn more money, but you could well be leading your life to the wrong place. There are some readers though who find difficulty in identifying their passion even after reading the articles and doing my purpose exercise. When I talk to them to understand the problem in detail, I realize that oftentimes, the issue isn’t with the exercise, but because they’ve not gathered enough experience about their likes, dislikes, and goals to actually know what they want. Finding your passion comes as a result of having gone through several worthy goal pursuits. You can’t possibly know your real passion unless you’ve taken the step to get out of your comfort zone, worked on goals with meaning to you, and experienced the ups and downs of a serious goal pursuit. Thus, I recommend to give yourself time to explore and experiment. Identify 2-3 things that you like (or you think you may like), and then spend 3-6 months dipping your toes in them. Take courses, start something on the side, read up, etc. (This can all happen while you are in a day job by the way!) Then, take stock. How do you feel about them after these few months? Are you still excited? If yes, great! Continue. If no, repeat with 2-3 different things for another 3-6 months. During this time, take note of what you like and don’t like, while re-reading my articles above to introspect on your lessons. At some point you’ll find something you feel really good about, that you’d like to seriously pursue as a career. What if you’re in between jobs or you’re currently in a terrible job at the moment? You’re not alone because I have many clients and course participants who are in such predicaments. I recommend getting an interim job that you don’t hate, that you’d be okay working in for a year or two. This would be a job that’s an improvement over your previous/current job and gives you new things to learn, while bringing you money at the same time. This way, you’ll not be weighed down by the burden of financial instability and have some time to properly figure out what to do next. After you identify your passion or a potential passion area, the next step is to study the market related to your passion. This is where we look at the second circle, “Market.” There are 2 goals here. Firstly, you want to know exactly what you’re getting into, as opposed to jumping in half-cocked. Secondly, you want to know what’s happening in the market so that you craft your best plans later on. What are the typical career options in this field? What does each option entail? What are the requirements to enter this field? What are the criteria for success? Do any of these career options interest you? (Or are there any aspects of a particular path that interest you?) What are they? What do you like about them? Look beyond standard career paths. Who are the people thriving in this field today? What exactly do they do? Why are they so successful? Is there anything you like about what they’re doing, that you’d like to emulate in your own path? What is it and why? What if you don’t know anyone in this field? Well, with the internet and meetup groups, you can get lots of information even without knowing anyone… yet. For example, say you want to be a trainer, but you don’t know anyone in training. What can you do? Firstly, research online. There are many trainers with online presences today, so you can easily google for trainer blogs to read up. Be sure to read from varied sources so that you get different perspectives. Secondly, meet up with people who have been living and breathing training as their job. Not people who are just talking about it, but people who are out there doing it. Toastmasters is a great place to meet professional public speakers quickly, especially those serving as mentors or judges. Meetup.com has so many meetups including on public speaking and training. With 550,000 monthly meetups in 180 countries, it practically has meetups on all kinds of topics in every corner of the world! Chances are, it has something where you live too. Attend talks and workshops by professional trainers — it’s hard to meet trainers 1-1, but through these events you can easily meet them. When attending these events, don’t just watch in the background. Approach these people and mingle. Understand how they got started and ask them for advice as someone starting out. They’ll be able to give you some ideas, even if briefly. Brief ideas from many people will give you a good overall picture. Thirdly, study world experts. You want to get both a global and local view of the industry. Who are the most renowned people in training today? What exactly do they do? Why are they so successful? While you probably won’t know these people personally, you can study their bios, interviews, and books to learn from them. The general steps above pretty much apply to any career field. Simply replace “trainer/training” with the name of your field and follow the tips. As you’re researching, take notes of what you like, don’t like. Understand what works, what doesn’t work in this field. This information will be crucial as you craft your passion plan in Step 3. During your research, it’s possible that you realize this isn’t your passion at all. This has happened to some of my clients before. For example, my client K came to me last year with a strong interest in corporate training. As she didn’t have prior experience in this field, I asked her to do a deep-dive into the industry, including cold contacting corporate trainers on LinkedIn, networking, reaching out to managerial contacts, and talking to her friends. After much research, she realized that corporate training isn’t a fit for her! That’s because her real passion is to help others express themselves and become their true selves, which is more of a life skill, while corporate training typically involves teaching industry-specific skills with life skills weaved into them. After deep thought, K realized that life coaching is a better fit for what she wants to achieve, and is now developing her coaching portfolio and taking on trial clients, among exploring other career mediums. If you ask me, this is a great thing. Imagine if K hadn’t done this research: she would have wasted years trying to get the right qualifications for a corporate training career, only to realize that it’s not right for her! Even though this shift might have seemed like a detour at first, and she had spent 2 months researching before realizing it wasn’t right for her, these were necessary steps to discover her ideal path. And this is something you need to recognize too. So if you happen to realize that what you thought was your passion isn’t your passion, don’t worry. It’s part of the learning process. 🙂 Simply return to Step 1 to explore and find a new passion area. Then, return to Step 2 when you’re ready. Once you do your research, let’s look at Step 3: adapt your passion to serve the market. What does it mean to “adapt” your passion? “Adapting” means to craft your passion in a way that’s relevant to the market. Even though you can pursue your passion without considering the world at large and be extremely happy doing so, you should convey your passion in a way that relates to others and adds value to their lives. Otherwise you are essentially pursuing your passion for your own benefit, independent of what others want, which is no different from pursuing it as a hobby. If your goal is to turn your passion into a sustainable career, you need to think beyond yourself and consider what the world wants, needs. There are exceptions to this though, such as lifestyle bloggers and YouTube personalities who seem to make a good living just by living their lives and talking about themselves. Like I said, this is an exception, not the norm. Additionally, these individuals are actually giving value — knowingly or unknowingly — by what they do. This value can be entertainment value (bringing laughter to people), social value (making you feel emotionally rewarded by being connected with them), or educational value (helping you learn something). This value can be a hit or miss though depending on what the market is looking for — for example, you could start a personal YouTube channel in hopes that people would be interested about you and your videos, but if your topics of interest aren’t things that people want to see, you’d be basically wasting your time (in terms of your career). Hence, it’s important to be deliberate about how you give value to others, because it ensures that you’ll definitely deliver the value your audience needs. Your message should both be (1) something you enjoy and (2) something that will bring a positive impact to others. Other examples of messages are, “To inspire people and help them step into their light,” “To empower women and help them succeed in dating, work, and life,” and “To organize the world’s information and make it universally accessible and useful” (this is actually Google’s mission statement). Identify who you want to reach out to with your passion. Next, identify your target audience (TA). This is the group you are going to reach out to, to impact through your passion. Your TA should be a group that (1) you are passionate about reaching and (2) isn’t too narrow (otherwise you’ll end up in a Passion, Skills, but no Market scenario). While your TA doesn’t have to be as broad as mine (my TA is the entire world! ), it should not be too narrow. For example, wanting to reach out to only people of a certain race+age group+gender is probably too narrow, especially if they make up a very small number. Know that when you restrict your audience, you prevent more people from benefiting from your stuff. Target as many people as you can while not diluting your messaging. Identify career mediums to best reach them. A medium is your vehicle to express your passion message and reach your TA. You should pick mediums that (1) you’re passionate about and (2) are readily used by your TA (you should have gotten some ideas during your research phase). For example, my message is to help others achieve their highest potential and live their best life. The mediums I use are blogging, ebooks, online courses, and videos. These are the mediums that (1) I feel passionate about and (2) are popular in today’s world. Recently, I started a podcast (! ), something I thought I’d never do, because I see podcasting as an increasingly important medium in reaching out to all of you today. Identify the change you’re going to make in their lives. What is the change, the difference, your TA is going to experience when they come in touch with your work? This change can be anything, from an improvement in your audience’s happiness level, to an increase in their knowledge, to an improvement in their lifestyle. This should be a change that your TA is looking for and is relevant to their lives. As opposed to sitting and hypothesizing what your audience wants, I recommend getting out there to talk to them directly. Get to know your TA. Understand them in person. Understand what they need and what will most benefit them. This way, there will be no guesswork. Create your ideal career vision. Last but not least, create your ideal career vision. Based on all the info above, what is your ideal career like? Who would you be serving? Who would you be working with daily? How would you be reaching out to them? What would you be doing every day? Notice how in each step, I kept asking you to think about what’s relevant to your TA, the market? That’s what it means to adapt your passion to the market. You want to ensure that you are doing something that will create an impact in others’ lives, while staying true to your passion. Even if your passion is supposedly very niche, you can still create a relevant passion career — by detaching yourself from its form and focusing on your message. For example, maybe you love drawing but the industry for drawing is not big. Understand your motivation behind your passion in drawing: what is it? Perhaps it’s to express your creativity and yourself, and to help others do the same (so here, drawing is the medium to achieve this message). By being clear of your message, this suddenly opens up a new host of mediums (drawing, writing, music, graphic design, public speaking) for you to pursue this passion. That said, there is a block you can face at this stage. This block is if you are only interested in salaried work vs. starting your business or venture. That’s because when you only look for jobs in employment, you limit yourself to the job vacancies in your country, which may or may not fit what you want. Not only that, you are subject to assessment of your potential employers (perhaps you are skilled enough but you lack formal qualifications, and because of that your employers pass up on your application). Even if you broaden your search to the region or entire WORLD, it may still be difficult to find something that matches what you want entirely. This was what I discovered when I tried looking for jobs that would match my passion before starting PE, which I shared in my Passion or Money? article. After exhausting all options, even willing to move myself overseas with my own money AND getting a job with a severe pay cut (and still finding nothing), I realized that the solution to my ideal career didn’t lie in a job out there. Because my passion and vision were so unique, I realized that I needed to create my own business, my own vehicle, to make things happen. That’s why I created PE and the blog you are reading now. Study all the job openings in the market right now. Research job portals, talk to headhunters, and seek out job agencies. Research each job. Is there any that resonates with you, that may be a fit with your career vision? Consider all aspects, from the job scope, to the company’s message and values, to the pay, to career development prospects. If no, consider broadening your search criteria (expand your geography or check out related jobs) and continue your search for another 2 months. Are there any new job options that fit you? Now that you have your vision in mind, it’s now time to build the skills to succeed in your passion career! This is where the third circle, “Skills,” comes in. Depending on your past experience and education, you may be starting from scratch. Or perhaps you have direct experience in what you want to do next, in which case you can simply pursue your passion career right away. For most of you though, you probably don’t have much related experience in your passion career. To that, I say, not a problem. After all, I used to be in this situation myself! When I discovered my passion, I was in my graduating year at business school. I had already signed a job contract to start work at a consumer goods company. Clearly, neither my studies nor my upcoming job had anything to do with my passion in coaching nor conscious living. I was dismayed at first, and felt lost and empty… for a few days. What got me out of my funk was when I realized that even though what I was about to do had no direct relevance to my mission, it didn’t matter as I could use this as a channel to build my personal skills before pursuing my passion. Subsequently when I started pursuing my passion in December 2008, I had no specific experience in coaching and training. The web landscape was also totally different from how I remembered it back in the 1990s. Even though it was a little overwhelming, I knew it was about quickly developing myself so that I could quickly get down to the things that matter, which is reaching out to you guys and helping you grow. I share some of the steps I took in my Skills Development article so I won’t repeat them here, but my point is that even if there is a wide gap between where you are now and the skills you need to pursue your passion successfully, there’s no need to feel sad and dejected. It’s simply about taking the steps to gain those skills. If you consider that most people today needed to study a 2-4 year degree/diploma to get into their current job, you should also expect some lead time before you’re able to soar high in your passion. For example, I’ve a friend who is a very prominent public speaking trainer and runs a very successful training business today. He only started his business about 3 years ago, so he has done extremely well in a relatively short amount of time, in a congested industry. While his achievements look smooth-sailing and it seems like his success has just come naturally, he was building his skills many, many years before he started his business. Previously, he was a regular participant at Toastmasters, having his speeches evaluated on a weekly basis, and participating in club and division contests month after month. He subsequently competed at many national and regional TM contests and became a 5-time Toastmasters champion! If this wasn’t enough, he competed in speech contests outside of Toastmasters organized by independent, credible organizations, in turn further raising his profile and expertise. Identify all the skills you need to excel in your ideal career. Order them by priority. Out of these skills, which should you be working on first? Create a plan to start addressing your skill gaps, and take action. I recommend tracking your progress as you’re working on your skills. Have a regular skill-audit to evaluate how you’re doing (you can use some self-created metrics, such as rating yourself on a scale of 1 to 10 in your skill, using meaningful attributes to track your progress, and so on). If you have the bandwidth, work on building 2-3 skills in one go, which can be helpful in drawing learning points across the board. Even though I label this as Step 5, it’s actually a step that can happen alongside Step 4 or even 3. As you’re building your skills, start to execute your ideal career plan. You shouldn’t wait until you feel 100% ready before you act. Why? It’s very unlikely that you can take action and see perfect results right away. There’s usually a big gap between our plans and reality. This is where it’s better to take lousy, imperfect action now and fine tune along the way, such that your plan is more accurate to reality. On the other hand, fantasizing in a dream world of perfect conditions and executing right at the end will usually lead to a horrifying situation where you realize your plans do not match reality at all, which then leads to lots of rework and time wasted. I’ve seen so many people fail because they refuse to test their ideas right away, instead hiding in an impenetrable cave where they assume everything they’re doing is perfect and right — in the end wasting months and years of their life working on an idea or direction that the market doesn’t want. You need time for the market to react. I call this the “lead time” for the market to respond to your efforts. For example, rarely do people get jobs right after sending their resume; usually they need to wait for companies to review the resumes, have internal discussions, and then arrange for an interview if they find you suitable. Rarely do businesses get customers right after launch; usually they need to market themselves, improve on their offering, and build trust before they get a solid customer base. For you, things like networking, marketing, researching, improvising, and engagement should happen earlier than later. Hence, no matter how far you’re from your ideal state, you can act on your plan NOW. Say you’re starting a business or freelancing. Look for opportunities. Network. Get your name out. Create a basic version of your product/service and test that with some people, for free. Get their feedback. Improve based on their feedback. Do this for a few iterations. Start charging a small fee when you feel your work is decent enough, and keep improving as you go along. As I mentioned above, when I started my business, I had no past experience in coaching or training. I started my site after 1.5 months of in-depth research and self-learning, decided it was time to launch a “prototype” site/offering, and then fine tuned as I went along. As my readers and clients learned from my material, I was busy learning too: constantly talking to experts in the field to get their feedback, asking my own clients/readers for their thoughts on how I could improve, upgrading my knowledge, and improving my skills. In the first year alone, I changed my layout countless times and changed my domain name, company name, logo, and brand colors. Even in my third year, I was still changing my domain name! This iterative process helped me build my business very quickly. If I had taken 1-2 years to strategize/plan in my magic cave, I think I would have wasted 1-2 years since I couldn’t have known what exactly people wanted or what I was doing “wrong” until I got to work with people directly. Even if you’re seeking employment (not starting your business), you can start networking, applying for jobs, consulting experts, and attending recruitment fairs. I once met someone at an event, Simone Brunozzi, who told me about how he landed his dream job at that time, the role of Technology Evangelist with Amazon — one of the largest companies in the tech world. What’s amazing is that: (1) He stumbled upon the job by chance, while he was checking out a job fair — without even knowing Amazon would be there; without even knowing a role like the Technology Evangelist existed. (2) He got the job despite being positioned “below the bar” (he worked and studied in a country town in Italy, which is poorly developed from a tech point of view). After the fair, he went out of his way to illustrate his passion, commitment, and knowledge by looking up the hiring manager, and then spent over 30 hours creating and custom coding a program related to the role and sending it to him. Needless to say, the hiring manager was impressed, and after a dozen interviews, Simone was hired. He would then work in Amazon and do very well for 6 years, before quitting to join a different venture. My point for sharing this story is to let you know that whether you’re looking for a salaried job, freelancing, or starting your business, there’s no “perfect time” to do it. Execute sooner than later. Then, fine tune as you go along. I hope you’ve found this post helpful. 🙂 I’ve made sure to pack it with practical tips and advice, and it ended up being 6,400 words long. All the best in your passion career! In the meantime, check out my articles in my passion series for tips on pursuing your passion.